10 Flawless. A must purchase. 2.0 A hint of quality. Well, you bothered to click onto the link for the review so we've given Esau some more exposure. If I'm right in thinking, you haven't heard of him either, just as I hadn't before his label contacted me. Esau is down with the group 'The Nobodies' and to the best of my knowledge this is his first release. Esau's album is one which will probably be very much slept on as he implies throughout this. In one of the tracks he mentions the reasoning for it on 'You Ain't Fly' (a track in which he disses very many artists and labels including what seems like the whole No Limit roster, Jermaine Dupri, Mya, Timbaland and more) with the lines "Mends Recordings is my label / Had enough confidence to make my project able / But they don't have enough money to make it available." From the albums first track, ironically enough entitled 'First' we learn that Esau is lyrically skilled. The track is on a sort of 'Nature Of The Threat' vibe in the sense that it talks about so called history in various ways, it focuses on the "first" things which happened, and had the hook been removed it would be a really good track, however, the hook which sounds unclear and sticks out takes away from 'First's quality. The oddly titled 'The Debut Album......The Farewell Tour' has Esau come off as a very pesimistic man that thinks negatively of a hell of a lot of things. However, he expresses this very well, he articulates his thoughts to a commendable level and takes control of the microphone professionally. Esau talks in detail about being a striving artist on 'Underground?' and also states who isn't underground, and how those that claim they usually are don't actually know what they're talking about. 'The Debut Album' features a variety of guests, The Nobodies are up on here on a few tracks, both emceeing and producing. There are a couple of appearances by Mahogany and one big arsed posse cut featuring Danja Mowf, Yaggfu Front, Apathy and Blackmel. '2 Many Emcees' features a nice beat by Da Wizard of Aahs and the aforementioned emcees doing there thing. Initially I wasn't that impressed by the track, but with more attention paid to it and subsequent listens, my opinion changed considerably. Production wise, Esau's 'Debut Album' is on the whole well done. PhatBoy handles the majority of the production, with his best beat being placed on 'Boo,' admittedly the title doesn't scream "Listen to me!" but trust me, it's nice. 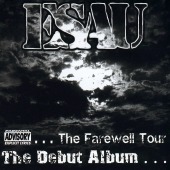 Essentially, the pesimistic rapper that is Esau has come up with a nice debut album. The guests perform well here, and production is also pretty well done. If you're looking to purchase this album, it's available at CDnow.com.